Dr. Bruce C. Heezen was born in Vinton, Iowa and received his B.A. from Iowa State University in 1947, his M.A. from Columbia University in 1952 and his Ph.D. from the Department of Geology in 1957. In 1948, he joined Columbia University faculty and became a charter member of the staff of the Lamont Doherty Geological Observatory where he rose from research assistant in 1953 to associate professor of geology. Heezen was best known for his pioneering work in mapping the ocean floors. Along with Marie Tharp, he developed the Heezen-Tharp physiographic maps of all the major oceans of the world. The maps have been widely distributed by the National Geographic Society. His other discoveries included the role of turbidity currents in shaping the seafloor. Heezen authored or co-authored over 300 scientific papers, articles and reviews in several languages. He also co-authored a book on undersea photography with Dr. Charles D. Hollister of Woods Hole Oceanographic Institution entitled The Face of the Deep. Among his honors, Dr. Heezen received the Henry Bryant Bigelow Medal from the Woods Hole Oceanographic Institution in 1964. He was also the recipient of the Walter Bucher Award presented by the American Geophysical Union. Dr. Heezen died of natural causes in 1977 aboard the Navy research submarine NR-1 just as it was about to explore submerged mid-Atlantic mountains off the coast of Iceland. 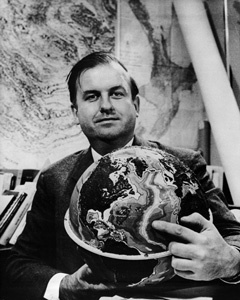 Heezen interpreted his early work on the mid-Atlantic ridge as supporting S. Warren Carey's Expanding Earth Theory which had been developed in the 1950s. The Oceanographic Survey Ship USNS Bruce C. Heezen was christened in honor of him in 1999.